SOPSIV provides a consolidated picture of the structure, composition and profile of the public sector, its workforce, executives and boards of governance. This year it has changed to include information about employee perception and experience in addition to standard facts and figures. SOPSIV now contains comparative data, findings from the People Matter Survey (i.e. the public sector’s employee opinion survey) and case studies of good practice. These additions provide richer insights about key workforce issues such as leadership, diversity, professional development, bullying and sexual harassment. 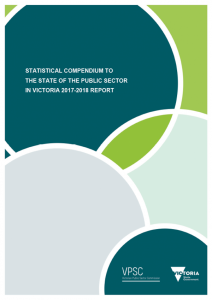 A companion document, The Statistical Compendium, is published with the report. 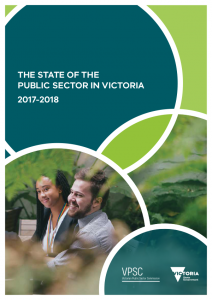 The Statistical Compendium includes the tables and charts published in the 2016-17 State of the Public Sector in Victoria Report. This is to ensure that previously published information remains accessible.